Yu-Gi-Oh! The Falsebound Kingdom, known in Japan as Yu-Gi-Oh! 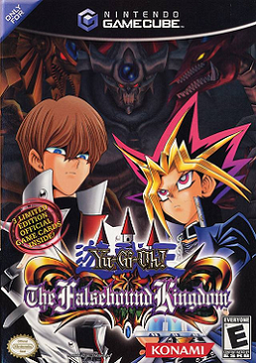 Falsebound Kingdom (遊戯王 フォルスバウンドキングダム ～虚構に閉ざされた王国), is the only Nintendo GameCube game in the Yu-Gi-Oh! series. Yu-Gi-Oh! The Falsebound Kingdom takes a different direction from the rest of the series, being more of a mix of real-time strategy and RPG elements, with gameplay very similar to that of Ogre Battle series than the typical card battling games seen on other systems. It features most of the major characters from the anime and manga series as well as 177 monsters. At first the player can choose between two storylines, for Yugi Muto (Yugi Mutou in the English Yu-Gi-Oh! manga and Japanese versions) and Seto Kaiba, but later the player can get one for Joey Wheeler (Katsuya Jonouchi in the English manga and Japanese versions) as well. The Yugi storyline involves Yugi, as well as Joey, Tristan Taylor (Hiroto Honda in the English manga and Japanese versions), and Téa Gardner (Anzu Mazaki in the English manga and Japanese versions) being invited to the testing of the virtual reality game "Kingdom," created by the company SIC. When they enter the game they soon find themselves trapped within it, and they must summon the help of the game's characters and monsters in order to defeat the game's villain, Emperor Heishin, and ultimately stop the plans of the game's designer, Scott Irvine, to control the three Egyptian God Cards. At one point in the Yugi storyline, some of your friends are brainwashed and you must fight them. Kaiba's storyline features Seto Kaiba and his brother Mokuba Kaiba, who are also trapped in the game. Initially they work for Emperor Haysheen (Heishin), but Kaiba soon turns against the Empire. A climactic plot event in both stories occurs when Mokuba is kidnapped, and Scott forces Kaiba to battle against Yugi. At the end of both storylines is a segment taking place within a secret room leading from the game's fantasy environment to the inner workings of the computer that is running the game itself. Either team must defeat Scott Irvine as well as the enemy DarkNite, wielder of one of the God Cards (Obelisk the Tormentor (translated as The God of the Obelisk in the English manga) in Yugi's story, Slifer the Sky Dragon in Kaiba's). After beating one story, the other storyline becomes harder, with higher level monsters; this is probably due to the ability to carry over monster stats from one story to the next. In this harder mode there is an additional villain, Nitemare, who has the God Card at level 99. Joey's storyline is a prequel to Yugi's and features some minor characters from the other storylines. Its main villain is Marik Ishtar who uses The Winged Dragon of Ra (translated as Sun Dragon Ra in the English manga). The game also includes a Challenge Mode consisting entirely of battles. This is the list of Duel Monsters featured in this game including the Fusion and Ritual Monsters in order of the Monster Selection. Where there are changes to the real life game, these will be listed. Some monsters keep their OCG artwork even in the English version of the game; therefore suggestive monsters, such as "Enchanting Mermaid" have not changed their appearance. This page was last edited on 27 September 2018, at 19:00.